Admittedly, I haven’t the slightest idea of what it means to be a woman (especially in these oh-so-confusing times). But, with the media on blast about weight loss products and plastic surgery, and super models — all rail-thin and covered in makeup — constantly being shoved in our faces, I assume that it’s difficult for them to maintain a sense of self. And, speaking through the lens of a male observer, this pressure has resulted in legions of upper-middle-class girls who, in a quest for individuality, starve and cut themselves, before quickly discarding one personality for another. Writer-director Sean Durkin seems to have come to the same conclusion, because his debut, Martha Marcy May Marlene, is an exploration into the psyche of a damaged woman. Unfortunately, an overly masculine narrative alienates the same demographic that it tries to address. It opens with the titular protagonist (Elizabeth Olsen) running away from a farmhouse in upstate New York. She breaks for the dense forestry, eventually reaching a nearby town, and, after years of silence, she frantically calls her estranged sister, Lucy (Sarah Paulson). Audibly distraught, she asks to be taken as far away from the backwoods as possible. Eager to reconnect, Lucy picks Martha up from a bus shelter and brings her to the weekend retreat that she shares with her new husband, Ted (Hugh Dancy), where she notices the escapee’s increasing paranoia and social detachment — the result of joining an abusive cult. Run by Patrick (John Hawkes), the makeshift congregation is run on a philosophy of self-sustainment, and whatever they can’t make, they steal. Its members are isolated, put on strict no-smoking, no-drinking regimes, and are assigned chores. Occasionally, they’ll break out the acoustic guitars and sing folk songs celebrating their joyful simplicity. However, women are given the short end of the stick and are forced to eat after their male counterparts, bunk down on mattresses spread out in the home’s empty rooms, and share simple and indistinct clothing. Nevertheless, the allure for these young girls — all of which are suffering from abandonment — is that Patrick, the resident charmer, markets the commune as a place of safety and cleanliness. 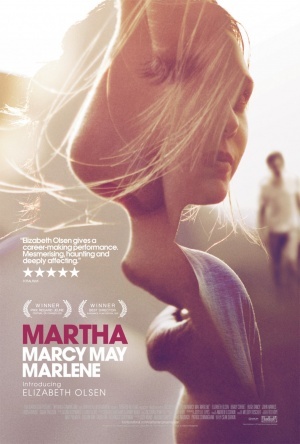 Much of the drama in Martha Marcy May Marlene comes from the contrast that rests in the aforementioned lifestyle and Lucy’s, and Martha’s mental state when being violently tossed from one to another. At the lake-house, Martha learns how her sister and brother-in-law operate as equals. Yet Patrick’s physical and psychological abuse has taken its toll, and the young woman slowly relapses into her pervious state, whilst, at the same time, attempting to escape it. This is shown through a series of shifts between memory, fantasy, and reality, as well as with subtle hints (such as when Martha busies herself by cleaning her sister’s home) sprinkled in-between the characters’ interplay. Brilliant cinematography (done by Jody Lee Lipes) ensures that the transitions are done in a way that doesn’t distract audiences. What’s most surprising about the film is Elizabeth Olsen’s (who, as many of you may have guessed, is the younger sister of the Olsen twins) talent. In her breakout role, the actress tries her best with Durkin’s two-note script, which has her conjure two polar opposites. Despite how convincing Olsen may be in playing either characteristic, the problem with this existentialist thriller is that there’s no middle ground. Without a believable devolution into madness, any momentum that the performer has is worth naught. Not let down by the screenplay, Hawke commands the screen. Nominated for an Oscar for his work in “Winter’s Bone,” he has become an essential character actor. As Patrick, Hawke is a terrifying charmer, who has no problem ripping his way through a woman’s insecurities and setting up camp in their subconscious — becoming both a source of support and fear. From a distance, he oozes dread, but it’s still no wonder why these women flock to him; whatever pain he delivers, he does in an unnaturally soft-spoken and inviting way. Hawke’s standout moment is when he performs a cover of Jackson C. Frank’s creepy “Marcy’s Song.” Despite a few changes, it remains hauntingly beautiful, and this scene is one of the more memorable. In spite of its critical-acclaim, Durkin’s direction comes off as too strong at times. Granted, the talent is there, and he’s still a freshman director and screenwriter and is sure to improve as his career progresses, but, as it stands, he doesn’t utilize setting or natural silence enough, instead choosing to spoil Martha Marcy May Marlene with superfluous dialogue and plot-devices, while ignoring the main plot. This, in turn, makes it seem like he wasn’t confident enough to allow the dreamlike atmosphere (created by the film’s crushed black color palette) to run its course. And once the inconclusive ending comes around, all hope is lost for the once-promising debut. Oh lord, I laughed out loud at your username.